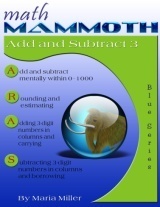 Math Mammoth Add & Subtract 3 - printable workbook for second or third grade. Math Mammoth Add and Subtract 3 has to do with adding and subtracting 3-digit numbers. The book is suitable to study after the student has learned to add and subtract with 2-digit numbers, and has learned numbers till 1,000. The goal is to teach the student to add and subtract both mentally and in columns within 0-1000. Since students usually learn three-digit numbers in second grade, some of the topics in this book suit second grade, some suit third grade. The first section of the book explores some mental math with three-digit numbers, and is suitable for second grade. We study adding and subtracting whole hundreds, whole tens, and ones within 0-1000, often comparing to similar problems within 0-100. In most of these lessons, the addition or subtraction is first illustrated with a visual model. You can use manipulatives instead, if you prefer. The next part (the middle part) deals with adding and subtracting in columns with regrouping. If you want to follow the grade levels, these lessons are intended for both second and third grade this way: the lessons are for second grade, until the topics of regrouping twice in subtraction and regrouping over zero tens in subtraction, which are for third grade. The processes of regrouping in addition and subtraction are first practiced using visual models, to ensure the student understands the concept (the "why"), and does not only learn the procedure (the "how"). Regrouping 1 ten as 10 ones, such as is needful for 546 − 229. Regrouping 1 hundred as 10 tens, such as is needful for 728 − 441. Regrouping two times (1 ten as 10 ones, and 1 hundred as 10 tens), such as is needful for 725 − 448. Regrouping with zero tens, such as is needful for 405 − 278. Here, first we regroup 1 hundred as 10 tens, then 1 ten as 10 ones. In the last section, the book includes addition and subtraction topics for third grade, starting with mental addition and subtraction. Through it all, students solve lots of word problems and practice some algebra in disguise, where they use a symbol or a ? for the unknown thing in the problem. We also study ordinal numbers, rounding and estimating, and order of operations. Then we study the connection between addition and subtraction with bigger numbers, which also aims to help children think algebraically. Lastly, students get to practice their adding and subtracting skills in a practical way through reading a mileage chart and other types of graphs. 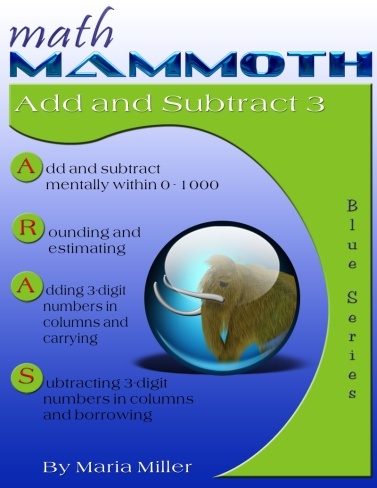 Math Mammoth Add & Subtract 4—a worktext about mental addition and subtraction strategies, regrouping, Roman numerals, the connection between addition and subtraction, order of operations, bar graphs, line graphs, and money problems (grades 3-4).